Christmas With the Rural Mail A gentle poem describing the..
A gentle poem describing the journey of a mail sleigh through rural Nova Scotia at Christmastime, delivering packages and parcels to children, Christmas with the Rural Mail is a holiday classic. 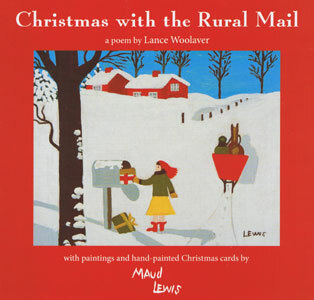 The poem is carefully crafted to fit Maud Lewis's colourful paintings, and the mail sleigh passes children skiing and tobogganing, oxen and Clydesdale horses pulling heavy loads, and the train station, among other classic rural winter scenes. Lewis's artwork is ideal for babies and toddlers, with its bright colours and simple forms, and the paintings and poem together perfectly evoke Christmases gone by. This is a sturdy board book edition great for young readers.